We are often asked if it is possible to run SOLIDWORKS on a Mac computer – the answer is YES you can! We know quite a few users running SOLIDWORKS successfully on a Mac however it isn’t supported by SOLIDWORKS. Watch our video summary here. We know quite a few users running SOLIDWORKS successfully on a Mac and SOLIDWORKS recently updated their system requirements to include virtualisation such as parallels. However, the limit of this support is that although it will install, it may not run well due to the lack of supported graphics card and therefore graphics acceleration. We therefore would NOT recommend this setup above a Windows based professional workstation. SOLIDWORKS cannot run directly on macOS, so first you will need to install Windows on your Mac using an application such as Boot Camp or Parallels. Boot Camp allows you to launch Windows on start up instead of macOS. We recommend this solution if you don’t need access to your macOS programs while running SOLIDWORKS; your whole machine will be devoted to running Windows so you can expect better performance as a result. Boot Camp is free to install though you will need to purchase a license of whatever Windows OS you are looking to run. For more information, take a look at Apple’s guide to Install Windows on your Mac with Boot Camp. Parallels allows you to simultaneously run a “virtual” copy of Windows and macOS. The advantage of this is that you can easily switch between Windows and macOS, but running this set up is very taxing and you will limit the performance of SOLIDWORKS, so you may struggle to work with assembly files. SOLIDWORKS’s have recently added Parallels to their list of supported virtual environments, though they still do not recommend using it to install SOLIDWORKS server products. Once you do get SOLIDWORKS running, you may notice that the graphics performance is not on par with Windows workstations, especially if you’re using a MacBook. This is because Apple do not offer laptops with workstation-grade video cards, such as the NVIDIA Quadro and ATI FirePro lines. These cards have drivers that support a technology called OpenGL, which SOLIDWORKS uses extensively. This means some display options like RealView aren’t supported when used with Apple laptops (Mac Pro desktops are available with these cards). There are some workarounds for this and we have seen users running these effectively, but again these are not supported by SOLIDWORKS or Solid Solutions. Your best bet for help with Parallels is their own support particularly their FAQ’s but are not officially supported by SOLIDWORKS and involves manual edits to the registry do so at your own risk and can cause issues with certain functions such as draft analysis. A similar process may be possible under boot camp however; this will need your own research and again is at your own risk. We recommend avoiding running the more demanding SOLIDWORKS programs such as SOLIDWORKS Visualize and the SOLIDWORKS Simulation Add-In on Mac as you cannot commit enough resource to run them effectively. However, SOLIDWORKS do develop several other applications that are available for macOS and iOS. This includes eDrawings Viewer for macOS, as well as eDrawings and eDrawings Professional for iOS. DraftSight is also available for macOS as a beta version. 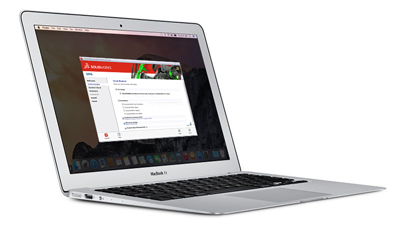 If you’re currently using SOLIDWORKS and considering a move to Apple hardware, or if you’re currently an Apple user and are considering SOLIDWORKS, we suggest contacting us to discuss the pros and cons of using SOLIDWORKS on mac OS before making any final decisions. Learn more about hardware and system requirements.